The American Livestock Breeds Conservancy calls the Chinese goose among the "most graceful and beautiful members of the goose family." Because of their resemblance to the swan, they're often called swan geese. Not only are they lovely to look at, they're easier to raise than many other goose breeds because of their exceptional foraging abilities. Chinese geese are available in two colors: brown and white. White geese have blue eyes; the distinctive knobs on their foreheads are orange, as are their feet and bills. 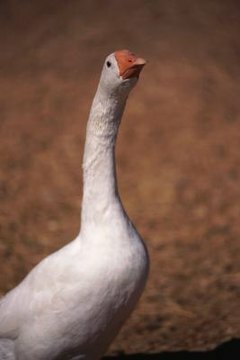 At maturity, ganders weigh about 12 pounds, geese about 10 pounds. Chinese geese are among the most prolific breeds, with each goose laying between 40 and 100 eggs a year. That's twice the average production of some other goose breeds, and they start laying earlier. For best results, provide each gander with several geese, to a maximum of six, rather than a 1-to-1 ratio. Keeping fewer ganders and more geese reduces competition in the flock. If you're raising goslings in a brooder, start the temperature at 90 degrees Fahrenheit, reducing it between 5 and 10 degrees weekly until you reach the maintenance temperature of 70 degrees. Make sure the birds have water available at all times. Since commercial gosling feed is hard to come by, feed them chick starter. Because of their natural hardiness, you can feed Chinese goslings the nonmedicated variety of chick starter. Supplement them with lawn clippings -- as long as they don't contain pesticides or herbicides -- or let them out for brief periods on pasture in good weather. By the time the goslings reach the age of 6 weeks, you can place them on out on pasture permanently. Because of their foraging ability, you don't need to feed Chinese geese while they are on pasture. These birds are nicknamed "weeder geese" because they will eagerly chomp down on overgrown, weedy areas. If sufficient forage is available, you might not need to feed them except for fall and winter. Feed mature Chinese geese turkey feed if commercial goose food is unavailable. If you want geese who'll also warn you when anyone approaches the premises, the Chinese variety is a good choice. On the other hand, because they're so alert and loud, they disturb the peace fairly frequently. While Chinese geese generally do well in low temperatures if you give them sufficient protection from the elements, their knobs can freeze during prolonged cold snaps.